Annnnnd we’re rolling along with the June Beauty Challenge! This one was a little vague as it just said “purple”. Since I picked up the Urban Decay Bittersweet Afterglow 8-Hour Blush last week I decided to share and swatch for you guys. I was dying to show you anyway. This blush is soo purty! 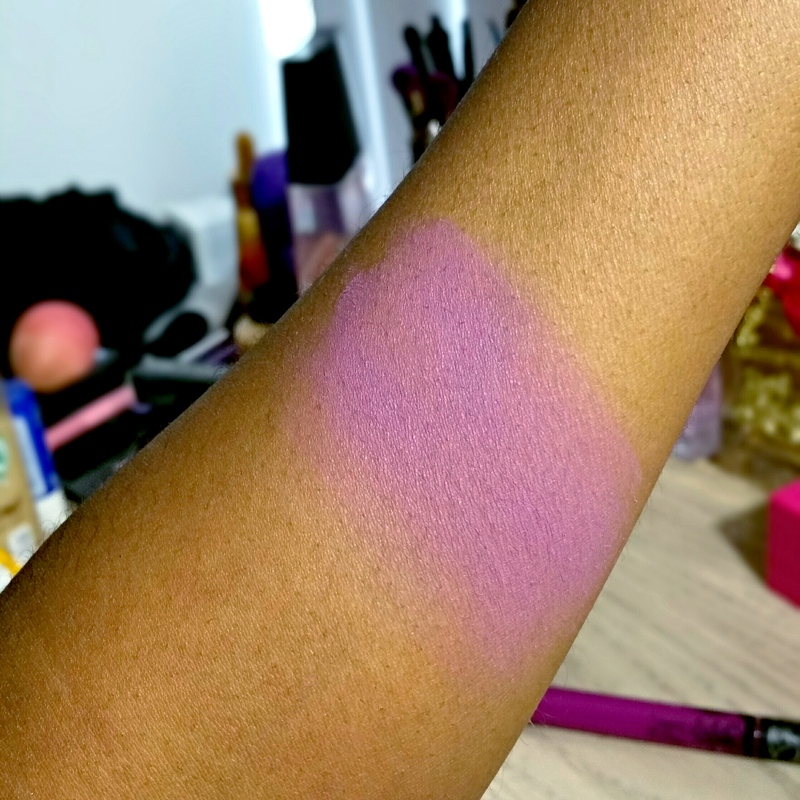 Bittersweet is a muted matte purple with a hint of pink and a soft, smooth texture. It’s pretty pigmented too. Naturally, Bittersweet caught my because it’s not often that you see a purple blush. Especially one that works for deeper complexions. So, of course, I’m pretty excited to try it out and pair it with some of my favorite purple lippies. I have a feeling it’ll look really good with Kat Von D L.U.V., MAC Heroine and Jordana Matte Dare. Oh, and MAC Men Love Mystery and Matte Royal lipsticks from the MAC Matte Lip Collection (along with Stone) which I finally ordered from Nordstrom this morning. I can’t wait to receive them and play in all my new purple goodies! Share something purple! 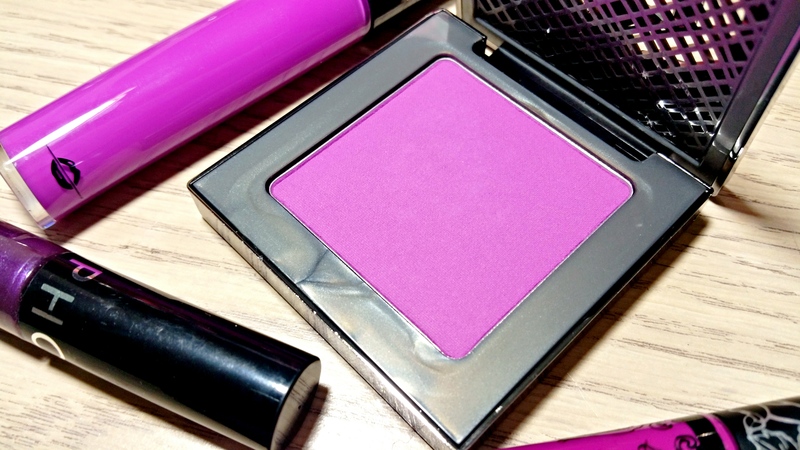 Have you purchased any purple goodies lately? What’s your favorite purple lipstick or gloss? I also have Bittersweet too and LOVE it so much! 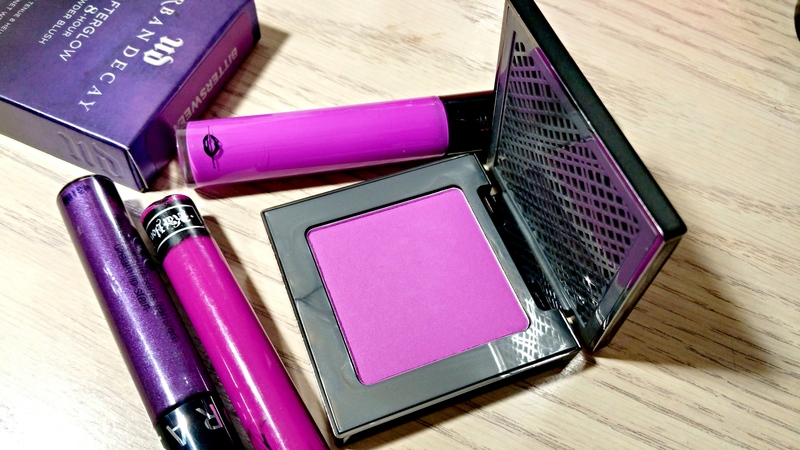 It’s my fave purple blush, goes so well with so many purple lippies/glosses. I can apply sheerly or build it up for extra oomph. $ 28 is the most I’ve ever spent on a blush but no regrets –such a unique shade and beautiful formula. My favorite purple lippie is of course MAC Heroine, but NYX Twisted and Colour Pop Grind are runner ups. And NYX Intense Butter Gloss in Berry Strudel is such a fun, bold shiny purple. I am OBSESSED with purple when it comes to makeup. Particularly lipsticks, but I might need this blush too! Sidenote: I agreed with your post on Temptalia’s page. It’s unfortunate that the comments had to go so far to the left. LOL, yeah, my local ULTA is pretty clean and well-stocked, EXCEPT FOR the NYX lippie section, which looks like it’s been attacked by a small army of lipstick-starved zombies! The lippies are all gone, or there’s a few half-gnawed, scratched ones left. I finally gave up and ordered online, but yeah I prefer to buy in-store so I don’t have to pay for shipping. I think you will get a kick out of Berry Strudel, so purple! You just described my local Ulta perfectly lmao! That’s EXACTLY how it is here. Every other section is spotless and well stocked. And then there’s they NYX section. A complete wasteland LOL. Ulta’s shipping (price + how slow they are) isn’t really ideal when you want just one thing so I’m gonna keep trying my luck. At least I finally found Berry Strudel. I think I’m gonna love it!